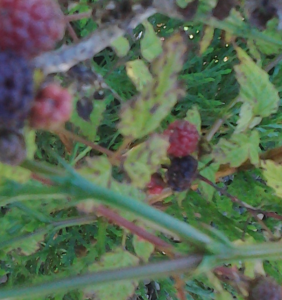 Names: Blackcap Raspberry is also known as Whitebark Raspberry or simply Black Raspberry. Rubus, derived from ruber, a latin word for red, is the genus of plants generally called brambles. It includes blackberries, raspberries, dewberries, and cloudberries. Rasp- may have come from a 15th century word, raspis, which means “a fruit from which a drink could be made.” “Leucodermis means white skin, or “whitebark”—referring to the very glaucous (whitish bloom) on its stems. 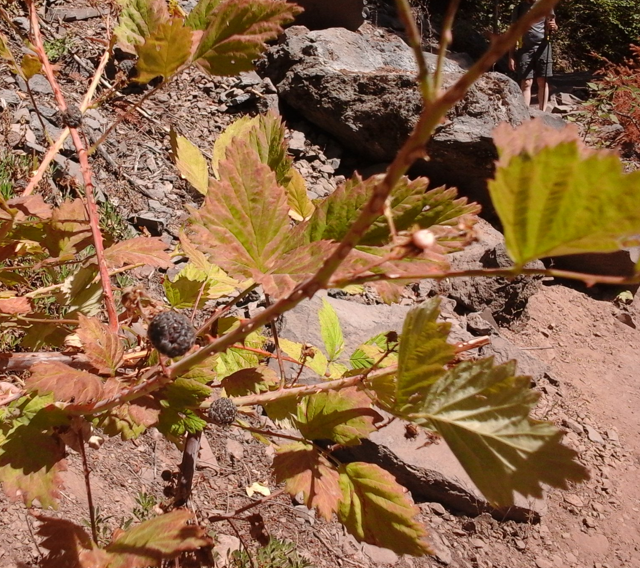 Relationships: Rubus is a large genus with between 400 and 750 species. Rubus is considered taxonomically complex due to frequent hybridization and a high degree of polyploidy. It occurs primarily in northern temperate regions, but can be found on all continents, except Antarctica. Many are grown commercially and several cultivated varieties are prized for their large, juicy berries, including Boysenberries, Loganberries, and Marionberries. The berries are actually aggregates of drupelets. There are about 200 species native to North America. In the Pacific Northwest, the three most important native species are Blackcap Raspberry, Salmonberry, and Thimbleberry. There are several smaller species, as well. Two of our worst nonnative invaders belong to this genus, Himalayan Blackberry, R. armeniacus (R. discolor), and Evergreen or Cutleaf Blackberry, R. laciniatus. Although they have delicious berries, and are excellent wildlife habitat, these species should be controlled as much as possible or they quickly take over disturbed habitats. Distribution: This species is native from central British Columbia (possibly into Southeast Alaska) to southern California; to eastern Montana, Utah, Arizona, and New Mexico. 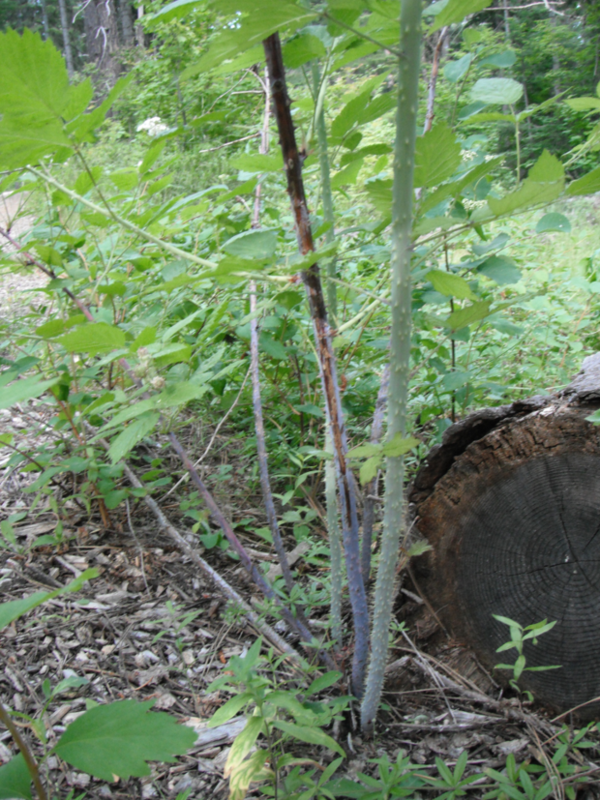 Growth: Black Raspberry canes arch up to 6 feet, (2m) tall. 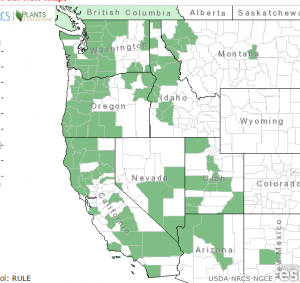 Habitat: It grows mostly in disturbed sites, fields, and open forests. Diagnostic Characters: Its stems are covered by a whitish or bluish, waxy bloom, and are armed with flattened, hooked prickles. Leaves usually have 3 sharp-toothed leaflets with white undersides. Flowers are borne in clusters of 2 to 7; petals are small, white to pink, shorter than the sepals. Fruits are the typical raspberry: a hollow globe-shaped “cap”; but ripe, seedy drupelets are dark purplish black. In the Landscape: This species is more often grown for its fruit than ornamentally. Its prickly, wild nature makes it best suited for a wild garden. Its bluish-whitish stems and arching habit are attractive, but its hooked prickles will grab or scratch anyone walking too close! Phenology: Bloom time: May-June; Fruit ripens: Jul-Aug.
Propagation: Stratify seeds warm for 90 days then cold at 40º F (4º C) for 90 days. 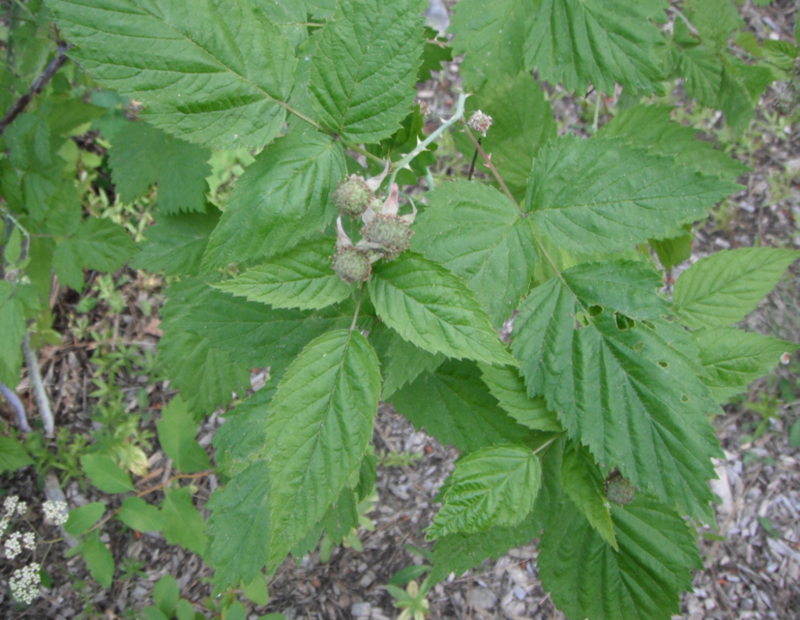 Blackcap Raspberry can be vegetatively propagated by cuttings, layering or division. Use by People: The berries were eaten fresh or dried by natives. They were also used to make a purple dye. In fact, when grown commercially, the soft berries are more often used to make a dye, such as is used on meat packages, than for food. Many people, however, love the flavor and use them to make pies, jams, jellies, or syrups. Berry-pickers beware! — the berries will stain your hands and it is difficult to avoid being scratched by prickles! A tea, high in vitamin C can be made from the leaves. Young shoots can be peeled, eaten raw, or cooked like asparagus. Use by Wildlife: The brambles rank at the very top of summer foods for wildlife, especially birds: grouse, pigeons, quail, grosbeaks, jays, robins, thrushes, towhees, waxwings, sparrows, to name just a few. The berries are also popular with raccoons, opossums, skunks, foxes, squirrels, chipmunks and other rodents. 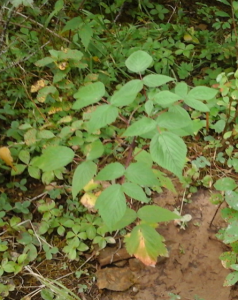 The leaves and stems are eaten extensively by deer and rabbits. Bear, beaver and marmots eat fruit, bark and twigs. Flowers are usually pollinated by insects. These usually prickly plants make impenetrable thickets where small animals find secure cover. The species type, Red Raspberry, R. idaeus, is native to Europe and northern Asia. Idaeus is derived from Mt. Ida in Crete where Jupiter was hidden as an infant. American Red Raspberry, or Grayleaf Red Raspberry, also known as Rubus strigosus (strigosus means bristled), can be found throughout much of North America, excluding the southwestern United States. In our region, it is found in some parts of the Cascades. Many cultivated varieties and hybrids are available for growing luscious berries; red, yellow, black, or purple! 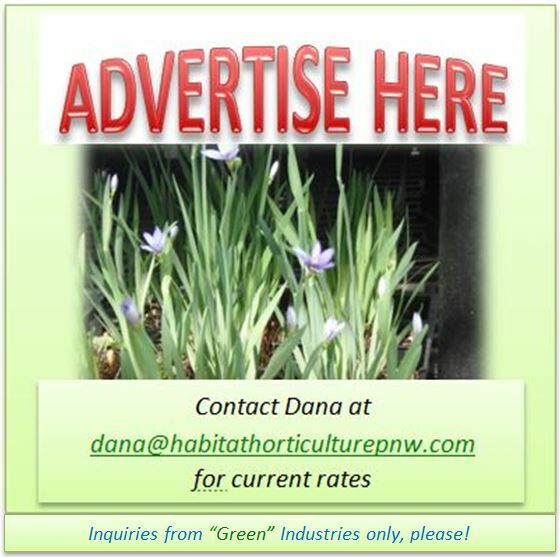 This entry was posted in Deciduous Shrubs & Vines on July 18, 2016 by habitatdana.